Settle in for an unforgettable beach vacation in the Beach Cabin. 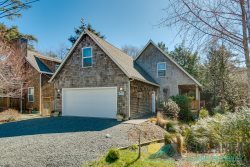 Just blocks to town and the beach, Beach Cabin is surrounded by the tall Pine and Alder trees of Manzanita, Oregon. This unique lot is great for kids to explore. The southwest facing deck is ideal for sunbathing, reading a great book or barbecuing with family and friends. The house is inviting with large windows and an open kitchen/dining/living room which makes entertaining a breeze. The king master bedroom has a 36" flat screen TV and an attached bathroom with a new walk-in shower with three shower heads. Across the hall from the master is a spacious bedroom with a queen bed. There is hall bath with shower only and washer/dryer nearby. The third bedroom is located on the lower level. Access is outside off the deck. This is a spacious queen bedroom with an attached half bath and is great for teens or as a mother-in-law suite. The lower deck has a hot/cold outdoor shower for use after a long day at the beach. The spacious living room invites you in with high ceilings, windows and a cozy wood-burning fireplace (firewood included). The 46" flat screen TV with a blu-ray player and cable are great for movie watching. The living room is open to the kitchen and dining area and the large, wall to wall windows bring the gorgeous outdoor scenery inside. The bright and roomy kitchen is fully equipped and stocked with everything you will need during your stay Beach Cabin is not a pet friendly property. Located close to town and the beach this home is the perfect family or group vacation rental! Maximum occupancy is 8. We prefer a maximum of 6 adults.